On my last trip back to my parents’ place, my mom gave me what should be the very last pile of stuff they’ve kept around the house: my report cards from preschool onwards. 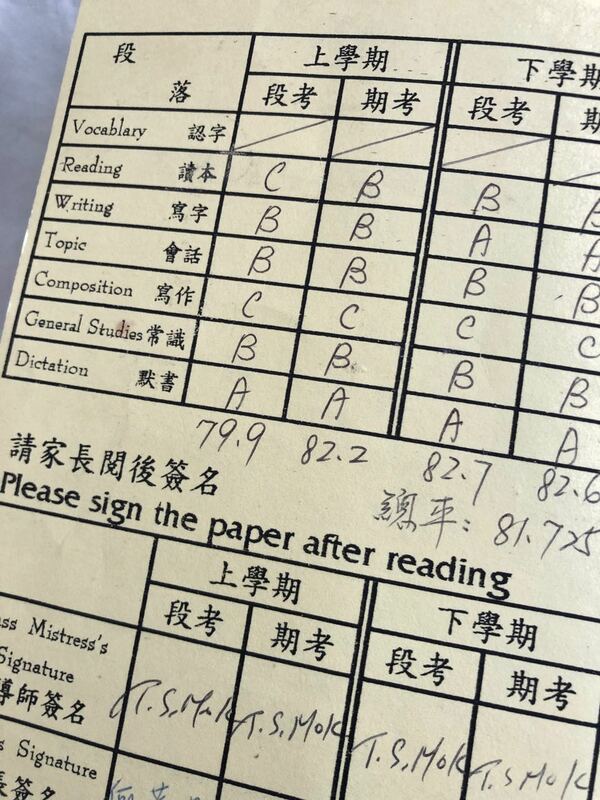 Turns out, in depressingly stereotypical Asian fashion, I participated in a lot of schooling as a kid, with a sizable stack of cards to show for all that effort. And though these reports were meant to be a form of accountability to parents from the classroom, looking back at the details and grades I had accrued, I do question their exact utility; how much can one teacher accurately assess 6-or-more attributes of their class of 30+ students? That said, I readily recognize and accept my poor showing around “Composition” in Chinese school. It was, in fact, one of a handful of memories I still have about schooling: I absolutely hated the task of having to come up with a couple hundred words around a topic, and had a habit of rambling on about irrelevancies to hit word counts. Most of my teachers were not impressed by this strategy, and marked my papers accordingly. In fact, I struggled with writing all the way through high school and into college. Despite my pride in completing a B.A. and receiving an education balanced between the purely scientific/technical with the liberal arts, the toughest classes I took were my B.A. literary requirements, which I chose to satisfy via undergraduate Rhetoric courses. Specifically, rhetoric is the study of argumentative writing, and I was at best a mediocre writer who had no original or interesting arguments to make1. But I have been blogging since 2004 or so, and here on allenc.com since 2010. And though I can’t proclaim to have become a great writer through short bursts of online prose, I’ve gotten enough positive feedback from friends and colleagues and occasional strangers to validate a level of literary improvement. This is more than an elongated and narcissistic patting of myself on the back. Reflecting on how much more comfortable I am in jotting down and eventually publishing my thoughts, I’m actually slightly bummed at how long it has taken; I sucked at writing for a very long time! It helps that the blogging format is quite forgiving, and that I only write about topics that I find stimulating2. Though this medium, I’ve been able to develop that elusive “voice” in my writing—itself, continually evolving—which has become a significant part of my self-definition. All of this is to say that sometimes, persistence and practice pays off.